Halloween is almost here. Skip the high-priced, store bought costume and save your money for the good stuff – those scrumptious candy bars and treats. You can make great outfits by using things you already have around the house or buy items inexpensively from a dollar discount or craft store, such as Jo-Ann Fabric and Craft Stores or Michaels that all offer a military discount. Don’t worry if you aren’t crafty and or just don’t have time. Many of these ideas are simple and easy to pull together in a night. Also, most of them require basic clothing that can be used long after trick-or-treating is over. Dressing up is one of the best things about Halloween. Now, you can avoid the trap of wasting money on purchasing ready-made costumes that usually get worn just once, then tossed. Instead, fire-up your imagination and get your creative juices flowing by using any of these 10 inexpensive Halloween costume ideas. For links to complete costume details and photos, visit Omni’s Inexpensive Halloween Costumes Pinterest board. Cut a hole on the top of the box for your head and cut off the bottom flaps. Trace the bowls along the front side, cut out the holes, and then glue the bowls into the openings. Prime and paint and you’re ready to be a walking Lego! For oxygen tanks, spray the bottles with white paint for primer and then three coats of neon acrylic paint. About a third of the way down from the top of the bottle, wrap a row of black tape and then on top of that wrap a narrower row of neon tape. Cut a piece of foam board so that some of it shows around the sides of the bottles and glue the bottles to it. Tie elastic string to the foam boards for arm loops. For flippers, make them from foam core and add elastic for wearing around the ankles, or if possible, just borrow a pair. You may want to use these just for photos and put your sneakers on for trick-or-treating. Download logos from the Internet and print them on iron-on paper. Cut them out and iron them onto the shirts. Cut capes from the satin material and pin onto tops. Paint a shell pattern on the top of the bicycle helmet using craft paint. Use the helmet straps to attach it around the baby’s torso. Wrap white tape around center of glasses. For tentacles, stuff women’s tights, sew the ends to a point, and then attach them to the neckline of the sweatshirt. For suckers, cut out circle shapes from the white and purple felt, making the white slightly larger than the purple, so the white shows when you attach them. Glue the purple on top of the white and then glue the suckers to the tentacles. Make the suckers larger at the top of the tentacles, getting smaller as you go down. Also attach suckers to the arms of the sweatshirt to make them also appear as tentacles. For eyes, cut a foam ball in half and use either black felt or a black marker to color the center. Glue the eyes to the hood. Create the egg white using the white foam core. Glue the yellow bowl to the middle of the egg white. Carry your spatula and you’re ready to go! For the bat wings, recycle a broken black umbrella by removing the top from the center. Cut the canopy in two pieces and attach them under of the arms of the sweatshirt. Make bat ears from the black felt and attach them to the hood of the sweatshirt. Make a tall pointy hat from the red felt. Using one glow stick as a guide, estimate how many you’ll need for the legs, arms, torso, and head. Don’t forget to use them on the back as well. Once you’re sure you have as many as you’ll need, then just keep them in their packaging until Halloween. Follow the packaging instructions to get the sticks to glow. Then, right before trick-or-treating attach them to the black clothing using clear packing tape. Rub it on firmly so they adhere well. Be creative. Attach them to shoes, hair, hands, and around the hood of the sweatshirt. Learn more tips for Halloween savings on parties, costumes, decorations, and sweets. Also, to make the most of this colorful season, check out these great DIY fall ideas for cooking, crafting, and décor and visit Omni’s Halloween DIY Pinterest board. 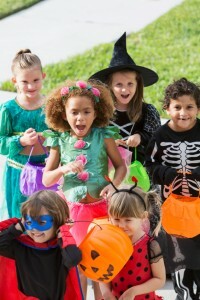 Candy, costumes, and scary decorations all make trick-or-treating lots of fun for everyone, but in the midst of the excitement and while creating your easy and inexpensive Halloween costume, don’t forget to keep your children safe. From everyone at Omni Financial, Happy Halloween!